I spent the day cleaning my work area and getting ready for my next project. 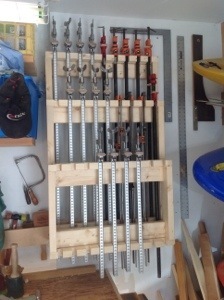 Part of the effort was building a rack to store my clamps and move them out of the way. I blogged during the week some of my thoughts and had some nice comments and ideas. 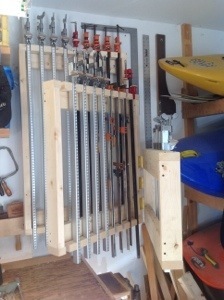 I had visions of wall mounts, carts, clamps vertical, clamps horizontal and then I stumbled across a couple of images on the web for the rack that I chose. Seems that there were several people with the same rack so I’m not sure who to credit but I built a rack that houses 27 clamps in three racks joined together with hinges. No fancy woodwork here, I just screwed it together mounted it on the wall and inserted clamps. Back to hand tools tomorrow. I am at the same point as you were just before you built the clamp rack! I have been trolling the web for a good fit and have come across something very much like the one you have built. Nothing fancy just functional and easily accessible. Thanks! Excellent, thanks for stopping by my blog. Nice! I spent yesterday cleaning up my shop space and making note of things I need to do to better organize my space. A rack to store my clamps was high up on the list, followed by a wall cabinet to store my hand-held power tools (router, sander, etc). I better finish my current project first.